In Europe and Oceania it is an alcoholic drink that is made from apple juice, through a process called fermentation. In the United States and parts of Canada, cider containing alcohol is called hard cider or alcoholic cider, while cider or apple cider means less-sweet, usually unfiltered, apple juice. In the United States and Canada people drink a special kind of cider around Halloween and Thanksgiving. This cider is usually unfiltered, rather thick, and it is often heated and spiced with cinnamon before drinking it. This is different from the cider in Europe, which usually is not heated. Usually to make cider, apples with a high concentration of tannins are chosen. The fermentation of the apples takes place at around 4-15° Celsius. The temperature influences the duration of the fermentation. The temperature at which the fermentation occurs also has an effect on the taste of the cider. Shortly before all the sugar has been fermented away, the cider is put in a new barrel which is made air-tight. The rest of the sugar will then become carbonic acid. This will also add to the life-span of the cider (no pasteurisation is needed). Cider is also the starting-point for distilling Calvados. This alcoholic drink is famous and very expensive. Calvados, Normandy: Calvados the drink is made of cider through a process called double distillation. In the first pass, the result is a liquid containing 28% to 30% alcohol. In a second pass, the amount of alcohol is augmented to about 40%. In France, Normandy is the first region as to the production of cider-apples (300 000 tonnes), and the first in cider production (7000 kilolitres). In France, some ciders can benefit from a protected naming. This is the cidre normand and the cidre breton. France is the country in the world that produces the biggest quantity of cider. The United Kingdom produces the most varieties, and along with Ireland holds the biggest market for cider. With 3° of alcohol and below, the cider will be sweet, similar to apple juice. In France they call this cidre doux, and use it to go with desserts. Between 3° and 5° of alcohol, you get a cider that can accompany a meal of fish or meat. The French call this cider cidre demi-sec or cidre brut (classique). 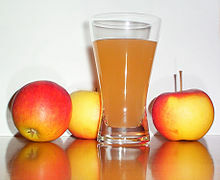 Traditional cider (hard cider) usually has 5° alcohol or more. Calvados is made of cider through a process called double distillation. In the first pass, the result is a liquid containing 28% to 30% alcohol. In a second pass, the amount of alcohol is augmented to about 40%. In France, the most popular are the first, second and fourth categories. In the English-speaking countries, it is possible to find cider with up to 12° of alcohol. The French and Spanish cuisines have recipes where cider is needed to make them. The French and Spanish also often drink cider instead of wine made from grapes. In Europe, many young people drink cider. Cider costs less than wine, and is often served in pubs and other places where young people go. The effects of cider are the same as those of any alcoholic drink. This page was last changed on 9 March 2015, at 00:41.